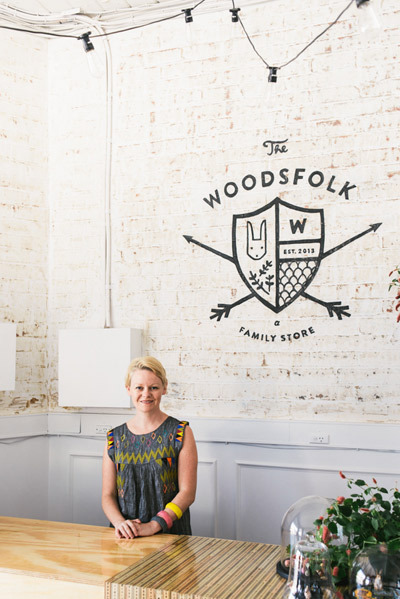 FK chats to Amber of wonderful new Hawthorn based store The Woodsfolk. Tell us about your store The Woodsfolk and what things we can expect to discover? 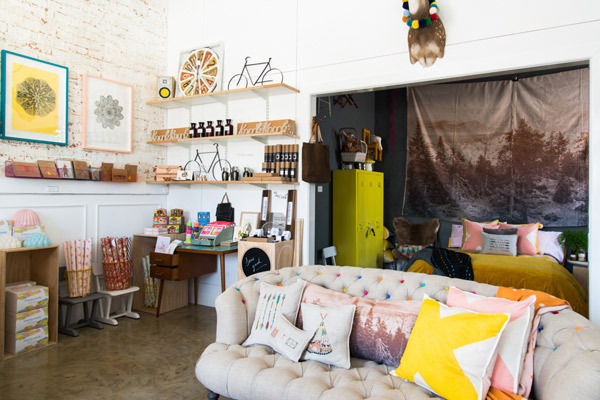 Our store The Woodsfolk is located in the leafy inner suburb of Hawthorn Melbourne. It’s a beautiful old corner building. Over the course of a few months we lovingly restored the space after years of being used for some interesting businesses such as a Denture Clinic, Stain glass window store and a lawyers office. The store is very much a curated vision of my personal style and interests. There is many one off pieces, works of art and lots of products featuring animals. We stock all sorts of things and call ourselves a ‘family store’ we also make sure that we have things for all budgets from a packet of cute erasers to a sofa. What was the inspiration with opening The Woodsfolk? I’ve always wanted a retail store. I really love talking with people and retail gives me the opportunity to work with a broader range of products to our wholesale brand Down To The Woods. In our wholesale business, merchandising is my favourite part and The Woodsfolk gives me the opportunity to do this on a daily basis not just at trade shows and catalogue production times. 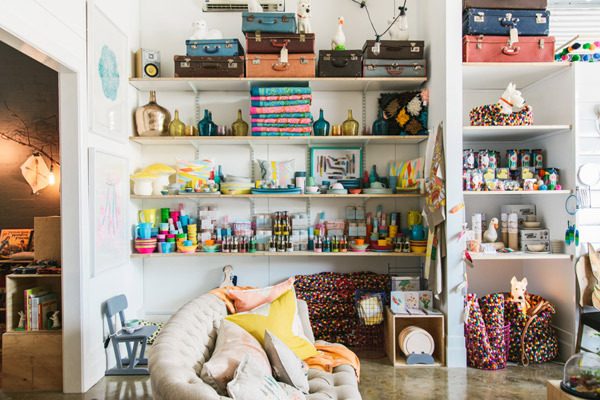 I really wanted a store that was beautiful and full of things that make people smile. 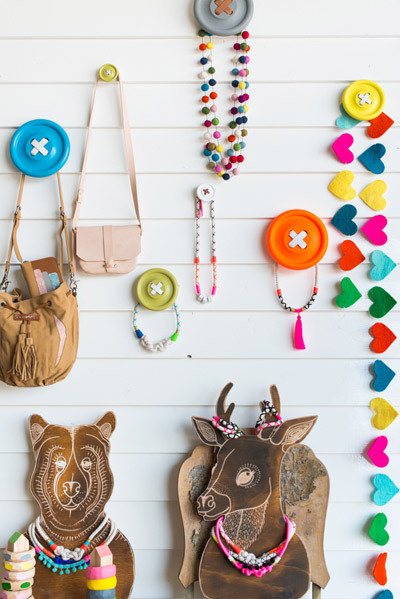 The Woodsfolk stocks a broad range of Australian designers – both established labels such as Mud and our label Down To The Woods but lots of little labels as well, such as Made By Mosey and Emeldo Jewellery, both local to Melbourne and all handmade. I also source from around the world, with Down To The Woods I get to do a lot of travel and having the opportunity to now bring to Australia some of those finds is really exciting! Accidentally it seems I’m rather partial to labels from mid-west and East Coast USA and from The Netherlands. We have an every increasing product base in store from both of those places. Great design that is practical and useful but most importantly things that make me smile really inspire me. Discovering these elements in products makes my heart sing and I just love sharing those finds when I come across them. There are so many talented folk out there and it’s so joyful to showcase their work with others. What do you love most about running The Woodsfolk so far? and what have been some challenges? Easily the best part is other people’s reaction to the store. I’ve been so surprised by how kind and enthusiastic people’s reactions have been and that so many people have gone out of their way to let us know how much they enjoy the store. It’s actually been really inspiring. When putting the store together I just really focused on things I love and really didn’t have a masterplan of how it would all hang together, so to have such a great response is both a relief and really rewarding. The biggest challenge has been juggling both businesses; the demands of wholesale and retail are really different to each other. Getting used to the new flow of things is taking time but we’re getting there. The closest thing I can liken it to is having a second child enter the family! When not at the shop I’m usually holed up in my studio across the river. But when I’m not at either I’m pottering at home with the family or exploring many of Melbourne’s great nooks and crannies, I’m from Sydney so Melbourne still holds many secrets I’m yet to uncover ; new cafe’s, mid-century furniture stores such as Grandfather’s Axe and local parks for the kids to run in are my weekend priorities. April is my favourite month in Melbourne so right now I think Melbourne’s at its best. There is so much to look forward to this year, I’ve got a number of sourcing trips planned. I can’t wait to discover new interesting designers, manufacturers and one-off finds in places like Nepal. Bringing those back and sharing them with our already enthusiastic customers is going to be really exciting! 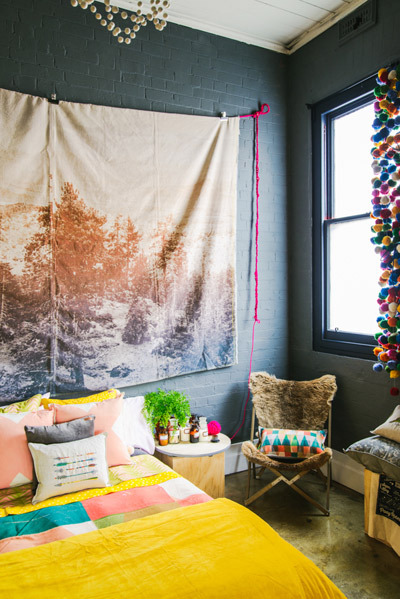 An explosion of colors and inspiration! Thank you so much for writing about our store! The Woodsfolk & Down To The Woods loves Finders Keepers and all your very clever exhibitors, you guys take market shopping to a whole new level of fun!! 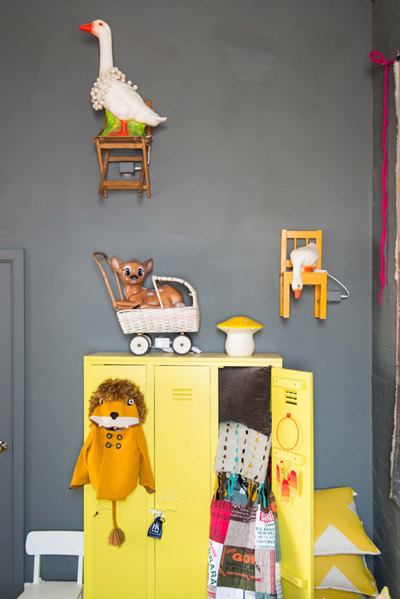 What is the painting on the left side of the wall in the last picture? Think there is another one on the left wall in the first picture too?